Part Three focuses on Krylia Sovetov, Orenburg, Rostov and Rubin Kazan. Krylia has developed a reputation in recent years as a yo-yo team between the RPL and FNL, having been relegated and immediately promoted again in each of the last four years. With Samara being a host city for the 2018 World Cup and a newly renovated arena at their disposal, pre-season developed hopeful optimism that Krylia could finally re-establish themselves long-term. Early doors this season, Krylia once again looked like they were finding the RPL a step too far. After a defeat to Rubin Kazan with Krylia struggling, Andrey Tikhonov was fired as manager and replaced by Mirodrag Bozovic. The veteran Montenegrin coach has tightened up the defence – which was leaking goals under Tikhonov – and has also grinded out some impressive wins, such as a 1-0 home win against Rostov. Sitting in 13th place, the Feathers are in a strong position to achieve their pre-season objective of safety. Recruitment was impressive in the summer. Veteran keeper Sergey Ryzhikov joined from Rubin, as well as re-signing Yohan Mollo, acquiring Vitaly Denisov from champions Lokomotiv, Romanian playmaker Paul Anton, and young defender Agustin Rogel – a South American Under-20 Champion in 2017. With further recruitment expected in the winter window, an experienced manager like Bozovic and vociferous and impressive crowd figures at the Samara Arena, I would back Krylia to survive. Positives: Since Bozovic came in, there has been an improvement at Krylia in both performances and results. In Bozovic’s eight games in charge so far, Krylia scored goals and conceded eight, a big improvement on only three goals scored and 14 conceded in Tikhonov’s eight matches in the dugout. Whilst a little raw still, the aforementioned Rogel is displaying signs of his talent in games so far. Finally, veteran Belarusian striker Sergei Kornilenko, despite his 35 years, still remains a goalscorer for the Feathers in their quest for survival. Negatives: It is a good job Kornilenko is still chipping in with goals as with only ten goals scored so far, Krylia are second lowest scorers in the league – only Anzhi having scored fewer goals with nine. Kornilenko and fellow striker Maxim Kannunikov have three goals each, however, their next highest scorer is four seperate players with one goal each. More goals are needed from the midfielders after resumption of play in March to alleviate the pressure on the aforementioned Kornilenko and Kannunikov. Grade: 6/10 – Would have been looking at a four pre-Bozovic, however, the Montenegrin’s impact on Krylia has been instant with three wins from his eight games so far. Aleksandr Samedov, one of the heroes of the Sbornaya this summer has signed for the club this winter after his release from Spartak and Jano Ananidze is expected to join on loan. Bozovic is well regarded in the RPL and his presence at Krylia would have helped them attract Samedov. With a decent squad and a few more winter signings, Krylia should have no problem avoiding the bottom two and qualifying for a promotion/relegation play-off. One would back them to win such a playoff and who knows, under Bozovic, they could yet even finish 12th or higher and avoid a play-off altogether. Before the start of season, we mentioned that FC Orenburg is based around aged players who are pretty much FNL level. Head coach Vladimir Fedotov has done a great job in getting the best out the sum of a pretty average set of parts. The Orenburgians scorea little but they rarely concede either. Thus, they even have positive goal margin (+2). Orenburg has a very defensive style of play. Nevertheless, the side’s counter-attacks are very fast and dangerous despte not scoring many. Much of this is due to a definitive lack of quality in the final third, with the strikeforce consisting of hard-working but profligate target men. The start of the season was impressive for the Orenburgians. After they lost to Spartak in the first matchday, the side won the next three matches against Krylia Sovetov, Lokomotiv and Anzhi (7-1 in aggregate) and played a draw with Krasnodar. In addition, the White-Blues showed a great performance against Zenit but lost 1-2. Orenburg took advantage of their home advantage, with the pitch’s specific synthetic grass surface to beat Rubin and Ufa at home. Now Orenburg is now tenth in a packed mid-table, five points clear of the relegation play-off zone. Furthermore, FC Orenburg have reached the quarter-final of the cup, a respectable run. In the first leg of the quarter-final, the Orenburgians lost to Arsenal Tula 2-4 home and it looks like they finish their campaign after the second leg. Four years ago, the White-Blues played in the semi-final of Russian Cup. Positives: After the fourth matchday FC Orenburg was almost inexplicably among the leaders of the RPL. The side’s defence looks strong and Orenburg creates rather many scoring chances. 24-year-old Aleksei Sutormin is one of the findings of the season. A right winger/second striker, Sutormin has already scored four goals and assisted two in all competitions. Negatives: The White-Blues need to improve the finishing of attacking players. Their proflicgacy is causing serious problems, as they are actually quite good at creating chances, as aforementioned. Attendance: the side has a tiny 7,500 capacity stadium. In the cold autumn, it is decreased to 3-4000 and even under. Though the city authorities promise to build a new stadium there is a question for whom the side plays. Grade: 7/10 – Orenburg have overperformed and only need a goalscorer to mprove farther. At this rate, they will certainly avoid relegation and could even finish in the top half of the table. 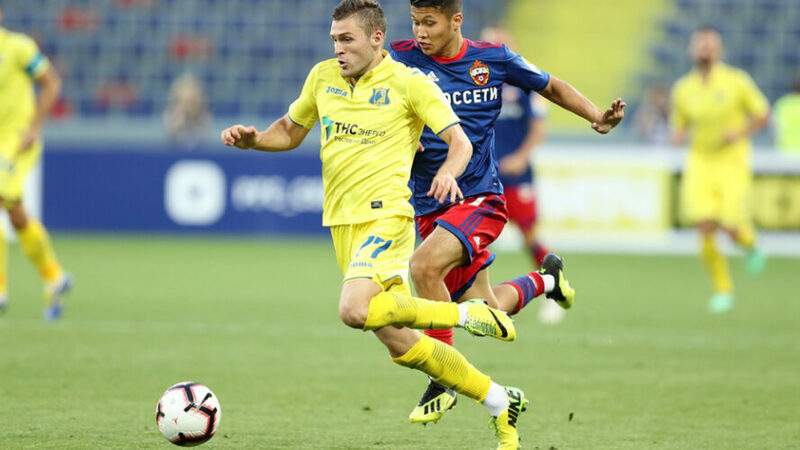 Many in pre-season tipped Rostov to be comfortably clear of any relegation trouble having embarked on an impressive summer recruitment campaign. However, few expected the Yellow-Blues to perform as well as their results so far. Under the guidance of Valeri Karpin, Rostov have impressed all season both home and away. Despite results having petered out a little in recent weeks, they currently stand in seventh place, just four points off Lokomotiv in fifth place and a Europa League spot. It is not just the results in the league which have impressed so far, the development of many young talents such as Ayaz Guliev and Dimitri Skopintsev has been a huge positive. Rostov have also impressed in the Russian Cup by making it through to the Quarter Finals eliminating current league leaders Zenit in the process. In the first leg of their Quarter Final against Krasnodar, Rostov battled to an impressive 2-2 away draw. A result which gives them a great chance to make the semi-finals. Finally, off the pitch, the club has been a huge success. The Rostov Arena is one RPL venue post-World Cup which has well and truly silenced pre-season fears of being a white elephant. With an average of 30,001 spectators at Rostov home matches this season, the club is currently ranked third behind only Zenit and Spartak for average attendances. Positives: Rostov are a well-balanced side with good players all across the pitch. They are also a very well organised side having conceded only eleven goals in 17 games so far. The defensive unit of Icelandic duo Sverrir Ingi Ingason and Ragnar Sigurdsson alongside Pole Maciej Wilusz have been amongst the best performers in their positions in the entire league. Rostov is also a hard side to defeat and rarely end up getting beaten comprehensively. Only Zenit in St. Petersburg has beaten them by a margin of more than one goal. Finally, as aforementioned, the development of players such as Guliev and Skopintsev and performances in the Russian Cup. Negatives: Perhaps one negative about Rostov is that they do not score a lot of goals with only 14 goals scored in their 17 games so far. Aside from Aleksei Ionov and Bjorn Sigudarson, who have both scored four goals each in the league, the next top scorer is central defender Ingason with just two goals. If Rostov are to maintain this impressive start and qualify for Europe, then finding more goal sources could be key. Grade: 7.5/10 – So far a very good season for Rostov. However, the spring will be a real test for them. Whilst they do not look in any danger of falling into the relegation battle, results did tail off a touch in the 4/5 games pre-Christmas. Furthermore, the impressive performances of their young players have caught the eye of bigger clubs in the league. Spartak has signed Guliev from Rostov for a reported fee of just over €1 million, exercising a buyback clause in their former youth player’s contract. Skopintsev and Ingason have also reportedly caught the attention of Zenit too. Rostov, should further players depart, will have to use all their transfer market acumen to find suitable replacements in order to sustain their so-far impressive season. Now in their second full season with Kurban Berdyev back at the helm, Rubin are still struggling to overcome their financial woes. Burdened upon them by years of reckless spending, most recently highlighted in 2016 with the appointment of now Watford manager Javi Gracia, and the spending of €40m. Many of the big-name players on even-bigger wages remained, before being let go just in the summer. Alex Song, Yann M’Vila and Sergio Sanchez were releases from their contracts, Ruben Rochina returned to Spain while Gokdeniz Karadeniz, Oleg Kuzmin (both retired) and Sergey Ryzhikov (free transfer to Krylia) let their deals run down. Relying on loans and free agents, Rubin put a squad together that still featured a number of Russian internationals, along with a sprinkling of talented youngsters. Ivan and Igor Konovalov and Egor Sorokin are young and have all impressed greatly this season, and while the season has developed, they have taken the opportunity to blood academy graduates Artur Sagitov, Danil Stepanov and Rail Abdullin. All three featured on the last match day before the winter break, as Rubin shocked Zenit with a 2-1 away win. Rubin’s performances on the pitch have been shaky at best, and this has been reflected in the stands. Attendances at the Kazan Arena were low to begin with, but is now dropping off significantly as the season progresses and the World Cup shine wore off. Positives: Sardar Azmoun’s early season form was a big boost, grabbing four goals and four assists very quickly in the season, however, they did dry up quickly. Rubin’s defence has been relatively steadfast, conceding just 14 goals so far, though these have been little and often, conceding no more than two goals per match all season, but with only a couple of clean sheets. As previously mentioned, Rubin’s young trio have been impressive. Ivan Konovalov has displaced the experienced Soslan Dzhanaev to become Rubin’s number one, and has been terrific since coming in. He’s only conceded nine goals in his 12 appearances, with Dzhanaev and Baburin combining to have conceded five in the other five. Egor Sorokin has become a Russian international defender just after turning 23, and has been in the goals from centre half – having plundered four already, the same as Azmoun – making him joint top scorer. He scored a dramatic injury time equaliser against Spartak just 12 seconds after coming off the bench, and then bagged a brace as they beat Zenit 2-1. Negatives: Rubin’s attack has been largely poor, and is thin on both numbers and quality. Dmitriy Poloz and Azmoun struck up a great partnership early on in the season, but injuries to both throughout the season saw versatile midfielder Khoren Bayramyan deployed up front on occasion, and then youngster Artur Sagitov towards the end of the autumn. If Azmoun performs well at the Asian Cup, there’s a chance he could be sold for some crucial money, while Rubin are waiting on a March decision from the CAS to confirm whether their European football ban stands. Grade: 6/10 – Performances on the pitch have not matched their surprising league position, but then they have been playing classic Berdyev football – unattractive but largely successful. If their European ban can be overturned then the chance of Europa League qualification is strong. If they hold their 6th place position, or better yet win the Russian Cup which they are still in – along with a number of the other big clubs – then having their ban overturned would be a huge morale boost and incentive for the rest of the season. With a couple more big names let go from their January contracts, and the addition of talented Spartak midfielder Vladislav Panteleev, there is a bit of hope that Rubin could once more enter the European positions.